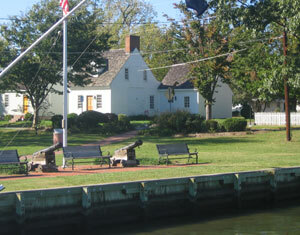 The five properties of A Historic St. Michaels Vacation are a group of restored historic houses on separate lots but adjacent to each other and the harbor in the historic district of St. Michaels. These properties are a short walk from everything in St. Michaels. The houses can be rented individually, or together when available. For large groups of friends or family, the houses provide a unique opportunity to vacation together, while each group has its own house. The houses can be rented short term, and if available, a house can be rented for one or more months (usually off season). 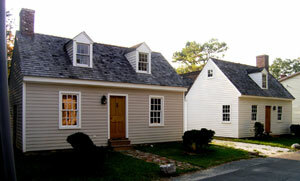 The large Thomas Harrison House, above, can sleep up to 10 while the Washington Melson House, shown below on the left, and the Thomas Blades House, shown below on the right, can each sleep 5, perfect for a romantic escape for a couple, or for a small family vacation. 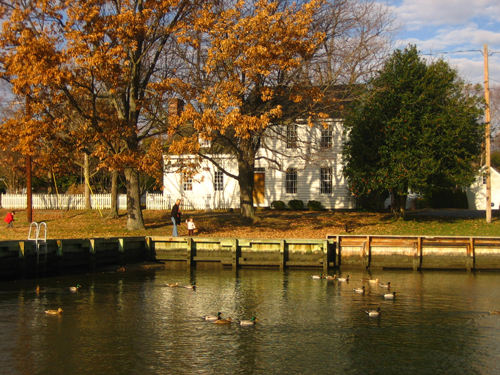 The John Bruff House, shown below, which sits next to the Thomas Harrison House facing the Park and Harbor also can sleep 5. The Carpenter St. Cottage, below, located around the corner from the Melson and Blades cottages, has a first floor bedroom, a den with a queen sleep sofa, and a large master bedroom on the second floor.